There a couple of ways to share a Saved Search on GovTribe. First, if you are using an account that has multiple users (a Standard or Premium account), all Saved Searches are automatically available to all users on the account. You can navigate to the list of your Team's saved searches from the side menu. There you'll be able to see a list of all Saved Searches - both the ones that you created, and the ones that other team members have created. Note that only the Saved Searches that you create will send you email notifications. 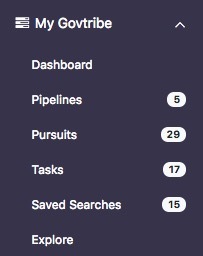 However, you can open and view the results of your team's Saved Searches, and you can create a local copy of those Saved Searches in order to set your own notification preferences. Note in the table below that for the Saved Searches created by me, I can View, Edit, or Delete them. For those created by other members of my team I can View or Copy the Saved Search. 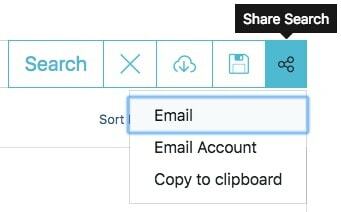 The other way to share a Saved Search - or any search query for that matter, whether you save it or not - is to copy and share a the link for the search. On any search page, you will see the Share Search menu item to the right of the search box. We provide you three options for sharing the direct link to the search query you are currently viewing (whether or not it is a Saved Search). Email - Opens an new email using your default mail application with the link in the email body. No email addresses pre-populate. Email Account - Opens an new email using your default mail application with the link in the email body. The email addresses of everyone on your account pre-populate as recipients. Copy to Clipboard - Copies the link URL to your clipboard so you can paste it anywhere you want to.